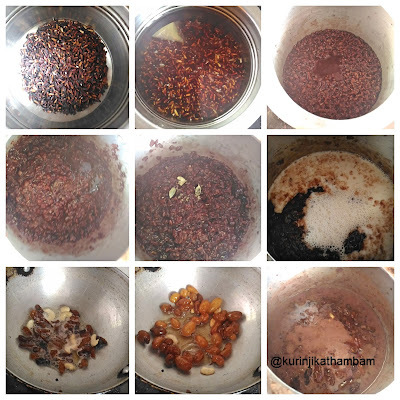 Black Rice / Kavuni Arisi Paysam is very very odd looking blackish pink colored payasam. The dry grapes are almost indistinguishable. 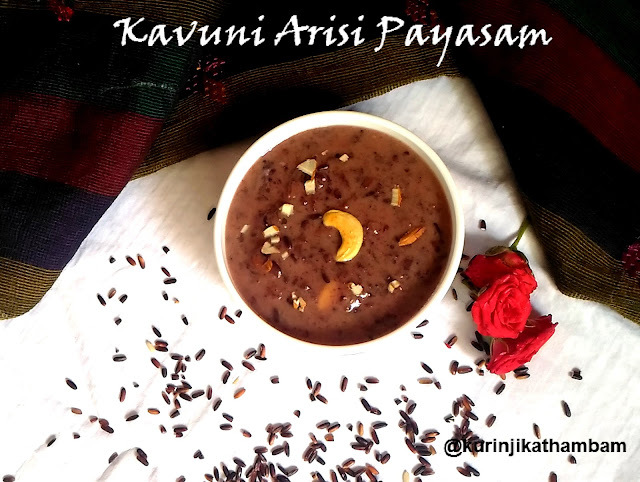 The sudden spice of sweetness when you bite the dry grapes without knowing gives kavuni arisi payasam its unique culinary effect. Black Rice Kheer is very popular in Manipur where it is called "Chak Hao Kheer". Black Kavuni Rice was once served only for royal family in china. It was called "Forbidden Rice” because it was denied to the General public. It was also called Purple Rice or Magic Rice because it changes color after cooked. Black rice is high in nutritional value and is a source of iron, vitamin E, and antioxidants. The outermost layer of black rice contains one of the highest levels of antioxidants found in food. Kavuni Arisi payasam is a great way to make people have Kavuni Arisi. Kids mostly like the blackish pink color and my kid really relished it. 1. Wash and soak the rice with 2 1/2cups of water for 4-6 hrs. 2. Pressure cook the rice with soaked water for one whistle in high flame. Then bring the flame into simmer and cook for 15 mins. 3. After pressure has gone remove the lid of the cooker and smash the rice with back side of the ladle. 4. Then add the Jaggery syrup and mix them well. 5. Then add the milk and powdered cardamom. Mix well and again heat the mixture till they become little bit thick. 6. Meanwhile, heat the ghee in a pan, add cashew nuts and raisins. Fry till the cashew becomes golden color. 7. Mix this fried cashews and raisins with the payasam mixture (from 5). 8. Then switch off the flame and transfer it into serving bowl. Serve it hot or cold as per your choice. 1. You can use fried coconut pieces instead of cashews. 2. You can use sugar instead of Jaggery. Click here to view more Kheer / Payasam Recipes. Hello Kurinji, Thanks for introducing new kheer recipe. May be it is common in Manipur but in Uttar Prdesh, never knew about it. Will give it a try.